It’s the first of November. Which means NaBloPoMo. Let’s see what happens when I force myself to blog every day for a month, shall we? Not having any practical experience with swans, all I knew was that they’re fair-sized water birds. Generally associated with ideas of beauty and grace and romance. And ballet. Clearly the people who think these things have zero experience with actual swans. Swans, at least, the ones I encounter (Mute Swans around here), are MEAN. Somewhere in the evolutionary process, they lost the ‘flight’ part of the ‘fight or…’ response. 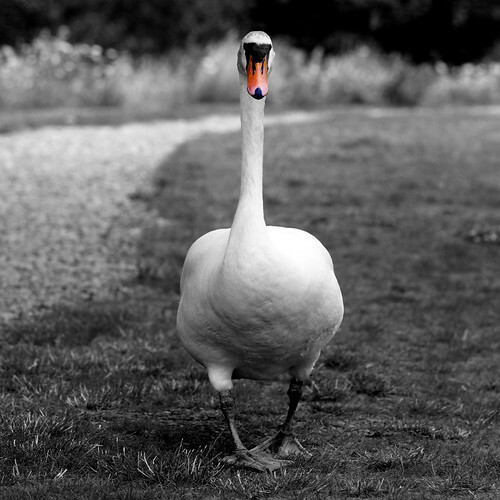 Swans are like that drunk guy in the bar at the end of the night who stands in your way because he really wants you to challenge him to a fight. And then, since he also has no sense of self-preservation, will come at you with zero fear and swinging with everything he’s got. Not Ostrich Huge, but if my 90lb dog were to get into a tussle with one, I’m not sure who would win. One morning a pair of swans with three cygnets (still fluffy grey, but already the size of geese) were blocking the bike path. There were five of us, fully-grown adults and bicycles, standing there wondering what on earth to do, because we were all too afraid to challenge them to move. Still a good lesson all around, I’d say.